1. Why do birds make such a racket in the morning when waking up? 2. How do they sleep at night without falling out of the trees? The cacophony of birdsong in the early morning is known as the dawn chorus. We don’t know for sure why it exists, but one idea is that birds use it to update their understanding of the neighborhood. Life as a bird is dangerous, especially as a sleeping bird, and many bird predators are nocturnal; so it probably is common for birds to die overnight. In the morning, the survivors sing to announce that they are still there, still defending their territory, still seeking a mate, etc. If there is silence one morning where before there was song, other birds know they can try to invade that territory and claim it for their own—and as territorial disputes generally involve much dueling-by-song, this adds to the dawn chorus too. To understand how birds can sleep without falling, picture a bird leg as being similar to your arm: its toes are your fingers, connecting to the “forearm”/tarsus (lower long bone) by the “wrist,” which at the other end has the “elbow” joint. The legs of perching birds are built such that tendons run from the bird’s toes, under its “elbow,” to the muscles that cause the toes to grasp. When the bird’s legs are bent—like when the bird is perched—the tendon is stretched by having to go around the bend of the “elbow,” so it pulls on the toes, causing them to grip. So a perching bird doesn’t have to consciously grip its perch: its legs automatically grip. Aren’t birds cool? To let go, the bird straightens its legs, allowing the tendons to shorten and stop pulling on the toes. 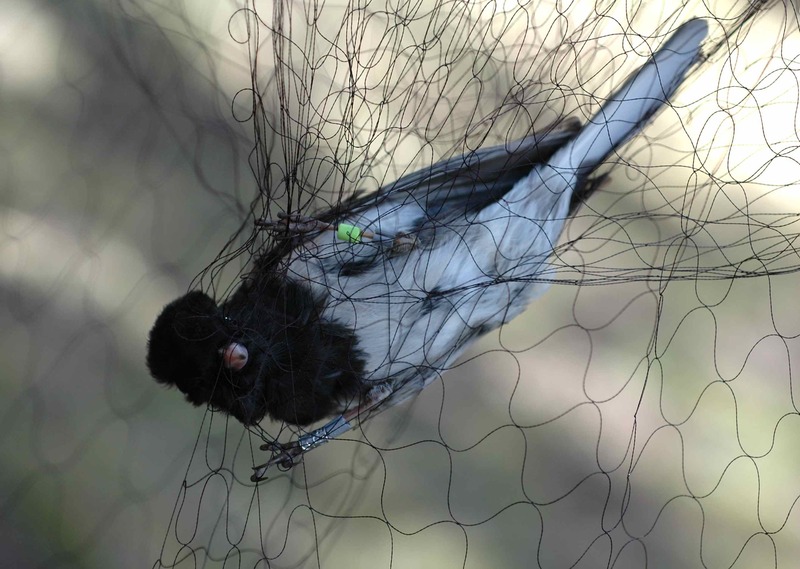 This is useful to know when you are extracting a bird from a mist net, because often you end up in the situation where the bird is free except that it is still holding on to the net. You can try to work every strand of the net out of its toes individually, but that is difficult, and generally as soon as you get one foot free the bird finds a way to grab onto the net again. However, if you gently pull the bird away from the net, unbending its legs, often its toes will relax and it will let go of the net all on its own. This entry was posted in general science-y stuff, miscellaneous and tagged birds, dawn chorus, ELEA, science, sleeping by toughlittlebirds. Bookmark the permalink. And now for another stupid bird question: when certain birds (not owls) look out at you from their left eye, they can’t see you with their right eye on the other side of its head. So what do birds with eyes on both sides of the head actually see? Two different scenes? Or some sort of panorama distillation? Something else? Or, we can’t know? Maybe the dawn chorus are God’s creation singing praise?